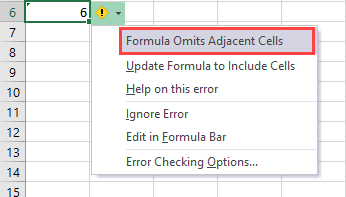 The Excel formula omits adjacent cells error can occur with mathematical or statistical functions, such as SUM, AVERAGE, COUNT, MIN, MAX. This error appears when there are cells with similar values to the one you chose that are not selected. 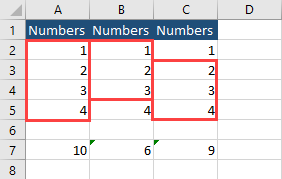 Excel recognize it as an error and symbolize it with a little triangle. I will illustrate it using the following example. In cells A7, B7 and C7 you have the SUM function, summing cells in each column. Notice, that in B and C columns, not all similar values are selected. In A column, you also don’t have all cells select (A1). But this is not the number type, so Excel understands it. There are a few ways to make this error disappear. Change formulas to have B5 and C2 cells included. Remove values from cells B5 and C2. Click the ignore error option. You have to do it for each formula. So far this error will appear until we tweak or work or click each example to ignore this error. But if you want to do this permanently and you don’t want Excel to inform you about this types of error, you can change it inside options. To do it, go to File >> Options >> Formulas. On the right side, under Error checking rules uncheck the filed called Formulas which omit cells in a region. 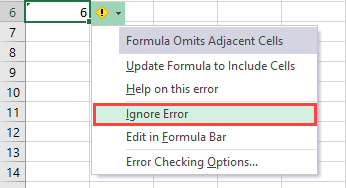 After you make this change, Excel will stop irritating you with this error message.